Tips to Avoid Tech Neck! 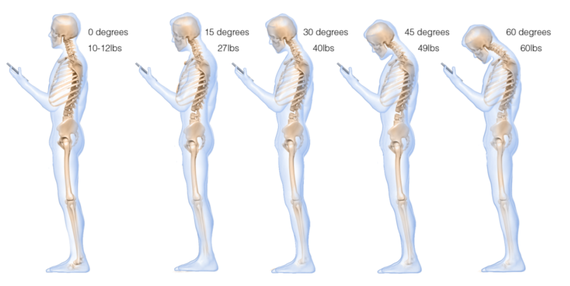 Recall years ago when smartphone users complained of “BlackBerry thumb” or “iPhone thumb,” an inflamed thumb due to excessive use.Recently, a diagram was published in Surgical Technology that revealed the impact of looking down at our smartphones to text, check Facebook, or search the web is having detrimental effects on our spines. Kenneth Hansraj, a New York back surgeon and author of the paper, stated, “As the head tilts forward the forces seen by the neck surges to 27 pounds at 15 degrees, 40 pounds at 30 degrees, 49 pounds at 45 degrees and 60 pounds at 60 degrees.”Today, Toronto’s Sunnybrook Hospital is chiming in and offered up several tips to ease the pressure on your spine and still operate your device. Sunnybrook notes that we should not let our head hang low, but “try to hold your mobile device up slightly rather than tucked right into your body.” In addition, we should look up “every 45 minutes,” do shoulder roll exercises, and while sitting in the car or the subway, “try to have your head and shoulders touch the head rest.”The latest stats in the CRTC’s Communications Monitoring report indicated that there are over 28 million wireless subscribers in Canada. There is no word on how many have suffered from discomfort from cell phone usage. Dr. C.H Suh, one of the foremost specialists in spinal biomechanics, and his research team have demonstrated that the slightest pressure on a spinal nerve as it merges on the spine destroys the function of that nerve by 60% in a matter of minutes, causing the nerve to malfunction! How much pressure is that? It is the weight of a quarter on the back of your hand. Clinical research has shown that a vertebral subluxation (misalignment of the vertebrae that compromises nerve function), once started, will usually intensify throughout a lifetime in a series of four advancing degenerative phases, ultimately terminating in a permanent condition, and a permanent lack of health. Chiropractors correct vertebral subluxation. It is possible to arrest the degenerative process, allowing your body’s recuperative powers to begin reversing the damage (depending on how much destruction has already occurred). You nervous system begins to function normally once again and your health and personal potential return. First Visit/ Initial Exam: In order to determine if and how Chiropractic Care will benefit you, we will complete a thorough one hour, head-to-toe examination. Prior to coming into the clinic, we ask that patients complete our Patient Intake Form (Click Here – to download the form). Your appointment will start with a consultation with the Doctor to review your history and any current concerns. Following the consult, the doctor along with the Clinical Assistant, will perform four types of testing: Neurological (sensory and reflex), Orthopedic (range of motion and joint function), Muscular (strength and balance) and Radiographic (x-rays). Second Visit/Report of Findings: We will report the results of your tests and answer all of your questions. If Chiropractic is right for you, we’ll build a personalized schedule of care for you to start treatment. If you wish to start care right away, once your report is complete, the doctor will talk you through your first adjustment. This appointment usually takes about 30 minutes. Workshops: We offer a complimentary one hour workshop for all new patients to attend. The workshop is meant to inform new patients about Chiropractic, basic health practices (nutrition, exercise), sleep methods and ends with an open questions/answer session. Regular Visit/Adjustment Appointment: A typical visit will be much shorter, but just as important! Once your personalized schedule of care has been determined, each adjustment appointment will be about 5 – 10 minutes. Goal: to stabilize and/or eliminate obvious as well as clinical symptoms and geta grip on the subluxation or problem. Our first objective is to give you relief from any pain or discomfort you might be experiencing as quickly as possible. Sometimes this occurs within the first few adjustments, but this is the exception. Our patient records indicate the only about 20% of the patients we are able to accept, notice significant relief within these first visits. the remaining patients most often require a longer period of time due to the nature, severity and duration of their subluxation, as well as the amount of damage/degeneration. We remind you that it will take a minimum of 90 days to make any lasting change to your spine and nervous system. Just as braces can take a minimum of two years, we ask for your patience in this period of care. Goal: Spinal reconstruction designed to correct vertebral subluxations that indicates the degenerative process can not only be slowed down and arrested, but also reversed. Your nervous system begins to function more efficiently and your health and vitality begin to return. That is our goal! Goal: Optimum spinal and nerve function and generalized wellness. Maintenance care will help to ensure that the spine stays free of subluxations, and that you have your best chance at 100% health.